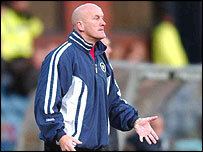 Former Dundee and Hibernian manager Jim Duffy has turned down an offer to become manager of Eircom League club Bohemians, BBC Sport understands. Duffy, who recently rejected an approach from Cambridge Utd, was Hearts director of football for a brief period last season. He has also had coaching roles with Chelsea and Portsmouth. Dublin club Bohemians are looking for a new manager after sacking Gareth Farrelly five weeks ago.